Location: Newcastle upon Tyne, Tyne and Wear, England. Ownership / Access: Newcastle City Council. Notes: The Castle, Newcastle is a medieval fortification in Newcastle upon Tyne, England, built on the site of the fortress which gave the City of Newcastle its name. The most prominent remaining structures on the site are the Castle Keep, the castle's main fortified stone tower, and the Black Gate, its fortified gatehouse. Use of the site for defensive purposes dates from Roman times, when it housed a fort and settlement called Pons Aelius, guarding a bridge over the River Tyne. In 1080, a wooden motte and bailey style castle was built on the site of the Roman fort, which was the 'New Castle upon Tyne'. It was built by Robert Curthose, eldest son of William the Conqueror, having returned south from a campaign against Malcolm III of Scotland. The stone Castle Keep was built between 1172 and 1177 by Henry II on the site of Curthose's castle. The Black Gate was added between 1247 and 1250 by Henry III. The site is in the centre of Newcastle, and lies to the east of Newcastle Central Station. The 75 feet (23 m) gap between the Keep and the Gatehouse is almost entirely filled by a railway viaduct, carrying the East Coast Main Line from Newcastle to Scotland. The Castle Keep and Black Gate pre-dated the construction of the Newcastle town wall, construction of which started sometime around 1265, and did not form part of it. Nothing remains of the Roman fort or the original motte and bailey castle. The Keep is a Grade I listed building, and a Scheduled Ancient Monument. 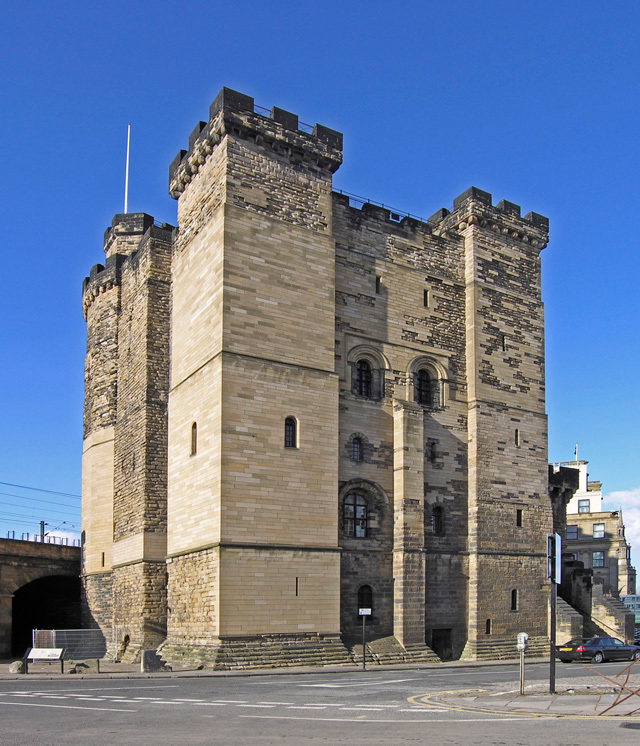 The Keep and Black Gate are now managed by the Old Newcastle Project under the Heart of the City Partnership as one combined visitor attraction, "Newcastle Castle".